Michael owns, operates and is the chef at his restaurant, Garlic Mike’s, right on the Gunnison River in what was once one of Western State College’s favorite watering holes called The Ramble Inn (“…and stumble out,” as the joke went). If you know Mike, then you know he goes by Michael, from Bergen County, New Jersey, right over the George Washington Bridge and about 30 miles from NYC. His dad was a general contractor plumber who liked to cook and mom was an Italian stay-at-home-mom and a bookkeeper, but Michael emphasizes, “Not a bookie…” Since he was the third child of five kids, he swears he suffered from middle child syndrome. “I never got any attention so that’s why I had to open a restaurant and name it after myself,” he chides. He also came from a large family with lots of cousins and the jovial Sunday dinners that the entire family attended. “My grandfather made wine. It was terrible wine, but he made wine. There was a lot of chaos, hustle and bustle with all those kids,” says Michael as he recalls the escalating clamor of the Italian family conversation during gatherings that to an outsider would seem like arguing. But in Italian-American East Coast culture, the louder everyone yelled, the more love there was being shared. “We had to fight to get a word in edgewise. Food was always a part of our lives,” he says, noting that his family carried on the European immigrant tradition of making their meals a time of joy and family communion. This is a large part of why Garlic Mike’s is such a success and a joy for Michael. Cooking for people and feeding them is not only what he does best, it’s his love of sharing as well as connecting with his community. There was never any doubt about what Michael wanted as a career. It’s always been about food. “Out of the class of 20 kids, I was one of only two boys in home economics because I wanted to learn to cook… and I wanted to pick up chicks,” he grins. Michael graduated from high school in 1983 and immediately enrolled at the Academy of Culinary Arts in Mays Landing, N.J., 25 miles outside of Atlantic City. After working as a chef in several restaurants and catering places, he landed a job as chef for a gentleman in Allendale, N.J., who decided one day to pack things up and move out west, scoping out areas throughout Colorado and Wyoming. Gunnison was the spot they picked. Michael’s fiancée, Traci Hobbins, moved with him. “We moved everything out here in August, went back to New Jersey, got married in September and immediately moved to Gunnison,” he says. He says that from the time he met Traci in 1992 he pursued her for an entire year until she became available after she split from her former boyfriend. Traci, who had a degree in fashion and was working in Manhattan, was waitressing her way through college. She claimed that she’d never work in a restaurant ever again. However, she now works alongside her husband as co-owner and business partner, handling everything from the restaurant’s books and wine choices to the marketing and decorating. When they first arrived in Gunnison, the couple was living in a house with their business partner and all the cooks they had brought out from New Jersey. “Traci was the only female and I practically had to carry her out of the house to calm her down at times,” Michael remembers. They both look back on those arduous beginnings with amusement. Since they felt that they couldn’t really hold their arguments in front of the entire household audience, “We went out to my jeep and went for a ride… in 30 below zero weather. I mean, we all worked and lived together, so it was hard,” Michael says. As the winter waxed on seemingly forever to the newcomers, they realized they had moved to the oftentimes coldest town in the nation. “We had heard stories of the brutal winters but we hadn’t experienced that kind of cold, ever. Sometimes we still think, like every January, what have we done? But never in the summer,” Michael says. Six years after they opened their doors as Garlic Mike’s, they bought out their business partner, which had been the plan from the beginning. Although Michael cooks traditional Italian dishes with the accompanying seasonings and flavors, he adds ingredients to “Americanize” the food somewhat to accommodate his Gunnison Valley client’s taste preferences. His wife makes the wine choices, recently tasting more than 150 wines over a four-month period to update their list. A few years ago, Michael was hired by a Gunnisonite to be their personal chef and accompany them on their vacation to Italy, where they had rented a beautiful villa overlooking the bucolic hills of Umbria. “One night, the owner of the villa took us to a restaurant that had closed because it was for sale but where they were aging some prosciutto in an old dusty basement. They had to dust it off before they slapped this slab of it on the table, started cutting into it, and there’s this dead pigeon on the floor. As the guy is slicing it, I’m looking at it, and at the dead pigeon, and I sneak the prosciutto into a napkin and hide it in my pocket. When the owner saw I had finished it already, he thought I liked it and kept giving me more,” which Michael also slipped into his pocket to toss when they got to the nearest trash. Michael’s very excited about the events surrounding his new River Bar, which he opened in June in the restaurant’s backyard. The little shed that has been converted into a bar was built by the construction class at Gunnison High School as their senior project. 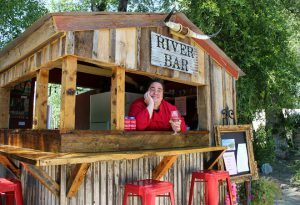 There’s a take-out right there on the river bank for canoes, rafts, kayaks and SUPs and a Float & Dine package in partnership with Three Rivers Resort, and those with reservations get to float to the River Bar, eat under a tent (all’aperto dining) and get shuttled back. But it turned out to be the real deal. Michael and his restaurant were featured on the show and have been in the reruns since 2012. Michael has his favorite dish, which he only runs as a special, and always on the anniversary of his dad’s birthday. “If I was on death row, I’d want my last meal to be osso buco [braised veal shanks]. It’s my favorite, but my daily food favorite is a puttanesca sauce with linguine.” When he was a kid, the pasta sauce would slowly simmer all day in its own simple richness, “and then, you’d dunk Wonder Bread in it,” to sop it up, he explains. “You could smell the meatballs cooking all day and it would kill you because you couldn’t eat them until supper,” although he confesses that he’d sneak one out of the pot. Both Michael and Traci feel that no matter how crazy the restaurant business is, “We love it and Gunnison’s a great place to raise kids.” The couple has two boys. Josh is 18 and just graduated from Gunnison High School and Matty is 15 and a sophomore. Josh is already in the family business, working in the kitchen, the pantry, doing the salads, desserts and appetizers. Michael also sells himself off to the highest bidder, for a good cause… he allows himself to be auctioned off as a fundraising benefit for the Adaptive Sports Center. “This fall I go to Texas to chef for some people who bought me,” he says. On August 11, Michael will be one of the prestigious Chefs on the Edge judges at the Crested Butte Center for the Arts. Even to this day, after 23 years, the Jersey couple feels like they’re still adjusting to the western ways of life. “We’re city people,” they admit in unison. But the fact that they’re still here, they say, “Means we’re gonna keep on pluggin’ away.” The rest of Michael’s family followed him westward within a year after he moved here. “My sister, my brother, my nephew and recently my mom moved to Gunnison. So we’re like a little Ellis Island here,” he laughs.